If you haven’t noticed, essential oils are everywhere you look. They are popping up left and right these days as more and more people are becoming aware of all the good they can do. There are many uses for essential oils. Some folks use them to help with heath issues while others use them to simply make things smell fresh. Let’s take a look at how to use essential oils in your home. Below are a few ideas to get you started thinking of how to do just that. 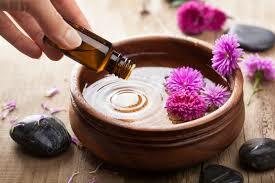 One way you can use essential oils in your home is to use them to cut down on bacteria and odors in your kitchen. The best way to accomplish this is to put 2 to 5 drops of lemon essential oil on a sponge and wipe down the countertops and other porous surfaces such as your cutting boards. Another way to use essential oils in your home is as a laundry freshener. Instead of buying dryer sheets all the time, just put a few drops of your favorite oil (perhaps lavender) on a damp washcloth and then toss it into the dryer. Yet another great use for essential oils in your home is to help freshen up your trashcan by adding your favorite oil onto a cotton ball, then placing it into the bottom of your trashcan. This will help to keep the trash smell from overtaking your house like it can sometimes do. You can even use essential oils to clean with by mixing them with baking soda, vinegar and dish soap, then use them to clean grout in your bathroom or kitchen. You will need to use about 10 drops of an essential oil mixed with 1 cup baking soda, 3 tablespoons dish soap and 1 tablespoon white vinegar to accomplish this. Using essential oils as a carpet freshener is another great way to use them in your home. Simply mix 1 ounce baking soda with 12 drops of your favorite oil together then sprinkle it over your carpets. After a period of about 20 minutes, vacuum the area for a clean fresh scent. For a good all purpose home cleaner made with essential oils, mix 20 drops pine oil, lemon and eucalyptus with 1 ounce white vinegar. Fill the rest of the bottle with water. Remember to shake it well before each use then proceed to use this concoction on anything from glass surfaces to kitchen countertops to widows. These are just the tip of the iceberg when it comes to how you can use essential oils in your home.